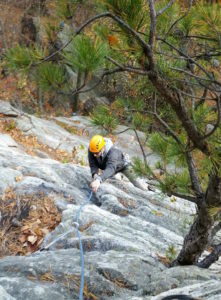 A week ago, I actually climbed a real route in the Gunks (New Paltz) – and even though it took me half an hour longer than it should have and I was huffing like I was at 25000 feet, I actually followed the whole thing clean, no falls or weighting the rope or anything. It was the best day I’d had in months, even though I couldn’t really move for two days afterward. Thanks to Felix Danila for guiding me and taking this photo. I realize this is ridiculous, but I’m starting to feel a little guilty. It makes me sad to sit in the chemo room next to so many people who are really struggling and have the nurses comment loudly on how well I’m doing. Not that everyone is anything but supportive and upbeat… in fact, it’s a surprisingly friendly room, given the hell that so many people are going through. Chemo-side-effect remedies are a wonderful topic to bond over with strangers. So yes, I’ve been doing well. The pattern is holding so far this time – I’ve been sick and run down since chemo Thursday, but I’ll probably be fine in the next few days. This last one was number 6, which means I’m halfway through, believe it or not. As I’ve said before, it feels like I’ve had this forever and that I only just started last week, all at the same time. So anyway…chugging along. Give someone a hug today. I’ve been doing this for two months? How many stages until Acceptance?